On November 16, 2014 I joined a group of 6 other venturesome birders and Aaron Lang of Wilderness Birding Adventures for his first fall birding trip to Adak. Luke DeCicco assisted Aaron in leading the tour. The photos were taken by either Aaron or Luke. My primary target bird of the Adak trip was Whiskered Auklet. We were a bit handicapped by being confined to land as we scoped the waters around Adak for glimpses of this little Alcid. Its big sibling, Crested Auklet, was present in large numbers, but hours of scoping led to just 3 (others saw several more) quite distant views of my target. Though somewhat distant, the smaller size and whitish under-tail area of this little seabird were enough, barely, for me to say yes, I have seen Whiskered Auklets, albeit with the help of a good telescope. Needless to say, we did not get any good pictures of the Whiskered Auklets. Thus I added number 736 to my North American Life List. Other targets which would have been new to me were the Asian species sometimes found wintering at Adak, Whooper Swans and Smew (a duck). We failed to find either. Perhaps this was because of the unusually warm weather at Adak, leading to open water on many of the inaccessible interior lakes which may have harbored the birds before the lakes froze forcing a move to the more saline waters near the shorelines that we were able to view. Off-setting the somewhat disappointing lack of new birds, were great views of at least 33 Emperor Geese. I had previously seen Emperor Geese at Adak in the spring, but the views were distant and poor. These fall birds were very cooperative and we saw them each day we were there. I think they are one of the most beautiful of the goose family. Another highlight was the sighting of 2 or possibly 3 light-phase Gyrfalcons. My only prior look at a Gyrfalcon was of nestlings north of Nome several years ago, so the sight of the adults was a thrill. 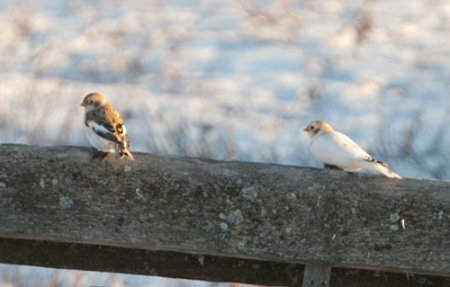 Among the more numerous inhabitants of Adak in winter were the colorful Gray-crowned Rosy-Finches, a lone Glaucous Gull, several Pacific Wrens and the dark Song Sparrows of Adak. In 1997 the U.S. Navy closed its base at Adak and the formerly nice homes at the base have deteriorated badly, especially since my last visit there in 2003. A few of them are still maintained and we all stayed in one of them where our leaders prepared all our meals. I am told that there are only about 40 registered voters living at Adak and we saw very few people among the deteriorating buildings. Supplies arrive twice weekly by air on Alaska Airlines along with the few passengers who come to bird or to hunt. We returned to Anchorage on the 20th and flew to Nome on the 21st. As our plane approached the Nome runway, it suddenly gunned the engines and lifted up and away from the runway. I later found out that the reason for the interrupted landing was that a herd of Muskox started across the runway. 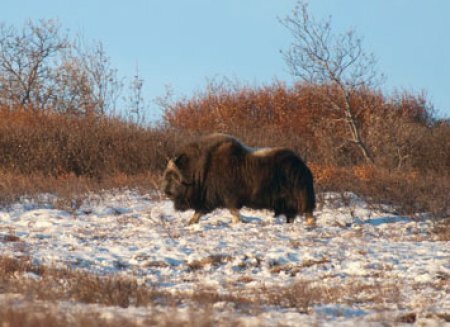 A large herd of Muskox is making the town of Nome their headquarters, to the chagrin of many of the residents. One of these most interesting beasts is shown below. My only target bird at Nome was the McKay’s Bunting. 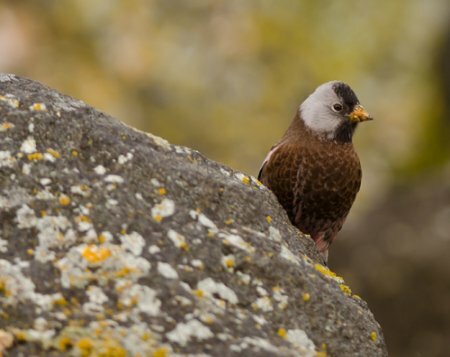 Fortunately on the afternoon of the day we arrived there we were blessed with long, close views of at least 20 of these beautiful little creatures as they frequented the feeder area provided by one of the Nome residents. 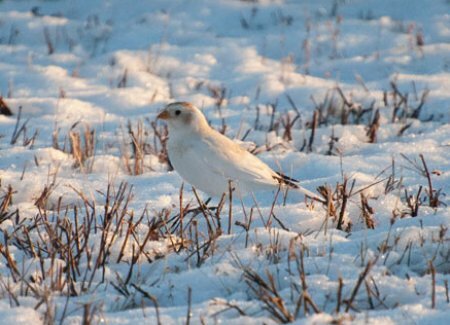 The picture below shows the contrast between a Snow Bunting in winter plumage (the dark bird) and the McKay’s Bunting in winter plumage (the right, white, bird). And so this beautiful and very difficult to find bird became number 737 of my List. This leaves me with only 1 ABA Code 1 bird to find (the Clapper Rail of the east which was recently split, with the newly named Ridgway’s Rail of the west being the one that I had previously seen while it was lumped with “Clapper Rails”), and 2 ABA Code birds, the elusive Sooty Grouse and the sea-going Mottled Petrel.